We reached Plavnik just before the sunset. The remote commercial fishing camp looked like the Russian version of an intentional community. Half a dozen wooden buildings huddled together at the mouth of Langeri River, tucked away in the northeastern corner of Sakhalin Island. Well-built and maintained, the remote camp is rather an exception to the ones that dot the coastline of Sakhalin Island. Perched on the remote section of the island’s coastline, the tiny, wind-swept community has all the amenities you might expect from a rustic bed and breakfast – running water, high-tech Japanese toilets with heated seats, a sauna and a large communal banya. As we arrived, two cooks, both women, as is typical of these camps, toiled in the kitchen. They were preparing a three-course hearty meal for a dozen or so fishermen who were about to arrive for dinner after a long day of fishing. After a 10-hour car ride from Yuzhno-Sakhalinsk, the region’s largest city, we covered most of the length of Sakhalin Island. Sakhalin is Russia’s largest island and part of the remote Russian Far East. 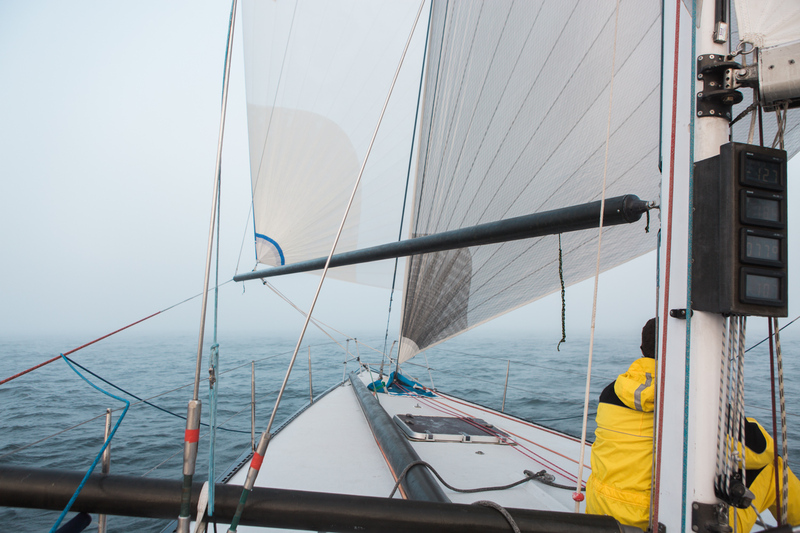 Stretching close to 600 miles, it is merely 25 miles across at its narrowest part. Shaped like a hanging hand, the island’s fingers stretch south, lightly tapping Japan’s northern Sappo Island. Vladimir Smirnov was already waiting for us in his office. The owner and founder of Plavnik, Smirnov is a fisherman unlike any other. A savvy businessman and an entrepreneur by heart, Smirnov tried a number of other businesses before settling on a commercial pink salmon fishery. He runs his business as if it were a big family – his crew is well paid, respected and generally taken care of. Smirnov is also an outspoken conservationist. His priorities are healthy, sustainable fisheries and the environment that supports them. Last year, he made the headlines in the Russian press with a presentation at a scientific symposium. He spoke up about the dangers and potential ill effects of salmon hatcheries on the wild, local salmon stocks. His was a dissenting voice among the Russians pushing for more salmon hatcheries. The regional fishery managers were not at all happy about this presentation. As hatcheries are being privatized and becoming a profitable business model, many in the Russian Far East are pushing to increase the number of hatcheries by several orders of magnitude. Although hatcheries themselves may not be profitable, the current Russian rules allow hatchery owners an exclusive claim to returning salmon. And salmon can mean big money. By building new hatcheries, even on rivers with healthy salmon runs, entrepreneurs can effectively monopolize returning salmon stocks and fishing grounds. After his presentation, Smirnov was kicked out from a regional salmon fishermen association over which he presided. The regional government publicly lashed out at him, accusing him of treason and collaboration with anti-Russian outside interests. Smirnov was in hot water, but far from giving up. He beefed up his private patrol that monitors and protects nearby rivers for poaching activity. He deepened his ties to local conservation organizations. When fisheries go through the voluntary Marine Stewardship Council (MSC) certification, they do so for one of several reasons. They might want to increase their market share in the global economy. Some European countries, for example, require that fish sold in within their markets are MSC certified. Other fishermen are intrigued by the potential premium price they can get for sustainably-certified fish. Or, their fish buyers might be demanding a proof of sustainability of their operations. A growing number of large American retail chains have sustainability policies, which dictate that all or some of the fish and shellfish sold in their stores must be certified as sustainable. These chains, like Target, Walmart, Safeway, Whole Foods and others, are putting a meaningful emphasis on the sustainability of global fisheries. When Vladimir Smirnov went through the MSC certification, a lengthy and expensive process, he could not reap any of those benefits for one simple reason. He does not own a fish-processing plant. For years, he’s been trying to raise the funds to build one. “When I build it, I want it to be done right from the beginning”. Without his own plant, he sends his fish to be processed at third-party processing plants that are not MSC certified. Without the MSC certification of the processing plants, called the chain of custody certification, he cannot affix the blue MSC check-mark and thus market his fish with the eco-label. The chain of custody certification insures that the sustainably-certified fish are kept separate from the fish that might not be as they travel from the fishing company to a processing plant to a wholesale buyer and then their final market. So why did he go through the trouble of a sustainability certification? 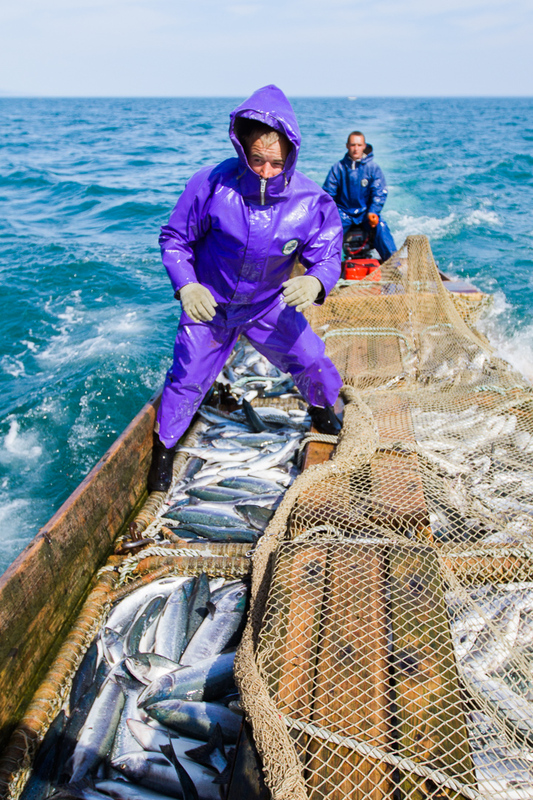 For Smirnov, the process and the press he got from the certification was another tool in his conservation toolbox to attract attention to the problems facing wild salmon stocks on Sakhalin Island, and in the Russian Far East in general. Perhaps, with a greater demand for seafood and a greater appreciation of what it takes to have fish last for generations, it would take the Smirnovs of the world to effect the needed change. 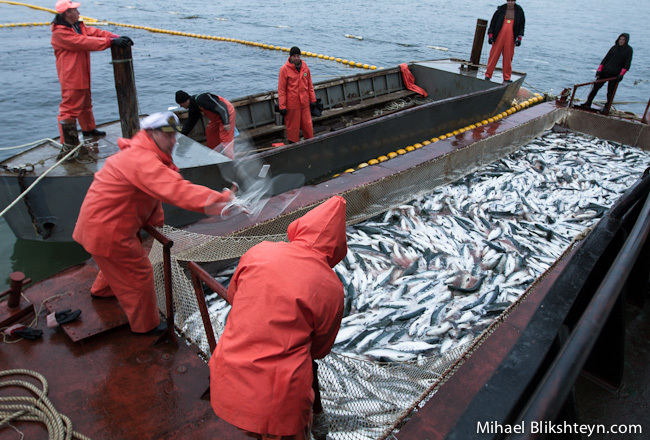 Most of the commercial salmon fishing in the Russian Far East occurs on the Kamchatka Peninsula and Sakhalin Island. Fish are caught with stationary traps along the coast and with weirs and beach-seining in the the lower reaches of salmon-bearing rivers. There are a few differences between the fishing practices on the Kamchatka Peninsula and Sakhalin Island. 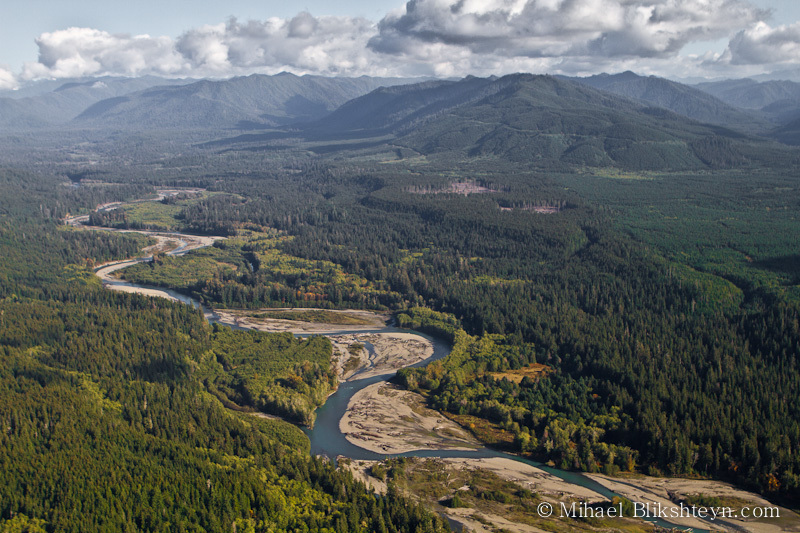 In both regions, salmon returning along the coast to their natal streams are caught with traps. Long curtains of nets are set perpendicularly to the coastline. Several of these nets are set at intervals on either side of a salmon-bearing river. The nets float at the surface, held up by floats and weighted down on the bottom. Schools of salmon, returning to their streams, swim parallel to the coast. They encounter the leading nets and follow them into the attached traps. The traps are made of two chambers connected by funnels in the middle. With every passing school, the traps aggregate the salmon into thick, jumping, silvery masses of bodies, tails and snouts poking here and there from the surface. Fishermen on the Kamchatka Peninsula normally attach one trap at the end of the leading net. See “Kamchatka: Coastal sockeye salmon fishery” for an in-depth look at commercial salmon fishing on Kamchatka. On Sakhalin Island, typically several traps are attached along the length of the leading net. Several fishermen in small wooden boats with outboard motors tend to them every day. The fish from the traps are emptied by hand into these boats and transported to shore. Interestingly, until recently, there was no commercial large-scale in-river fishing on Sakhalin Island. In the past several years, the regional government changed the rules, against a wave of protests and people’s outcry, to allow blocking salmon rivers with weirs. The weirs are set across the length of the whole stream to prevent “over-escapement” to the spawning grounds. It is now often assumed by the Russian government officials and some fishery managers that letting more than two salmon per square meter of the spawning ground pass to headwaters will result in lower egg and salmon fry survival. This thinking is based on an obscure Russian 1960s report. The new practice of blocking rivers on Sakhalin is something akin to the “scientific” whaling by the Japanese, where whale meat is sold for consumption. On Sakhalin, fish passages are blocked at the river mouths by weirs and scooped out for commercial sale. In theory, companies who are permitted to do that are supposed to keep track of the numbers of fish removed and allowed to pass. They are also supposed to ensure that enough fish pass to allow for long-term sustainability of those stocks. In practice, there is little monitoring and enforcement, and hardly any stream-specific data are available on the number of fish that should be allowed to pass. On Kamchatka, on the other hand, the weirs are used strictly for scientific purposes, to keep track of the number of returning salmon. The in-river fishing is done with beach seines and could be easily monitored and regulated, at least in theory (see “Kamchatka: the in-river sockeye salmon fishery“). To see more photos of these and other fisheries, please visit my Commercial & Artisanal Fisheries Portfolio.